Criterion Catalysts & Technology supplies refining and petrochemical catalysts for hydroprocessing applications, including tail gas treating, alkylation pretreatment, isomerization, hydrotreating and hydrocracking. Criterion’s facility in Azusa, CA installed a NOx scrubber system engineered and built by Tri-Mer. It has a 3000-cfm capacity at 250 lbs./hr. of NOx. This NOx scrubber has four polypropylene columns, three of which form the scrubbing portion of the system and use Tri-Packs column packing. A stainless steel quenching column cools catalyst process off gases from 500 to 150°F. 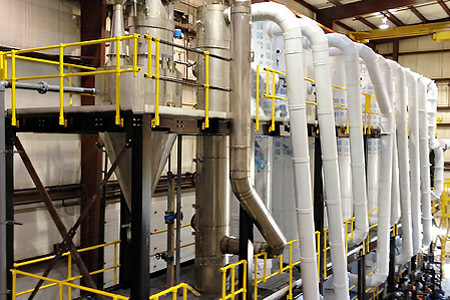 The scrubber uses an irreversible process involving proprietary solutions and chemistries. Residence time of NOx is minimal, based on the high NOx loading relative to the NO/NO2 ratio. The system operates at greater than 99% efficiency on both NO and NO2 and the stack is clean. No harmful liquid byproducts are generated by the system: the only liquid effluent contains a small amount of soluble salt that is processed by the facility's waste treatment system.